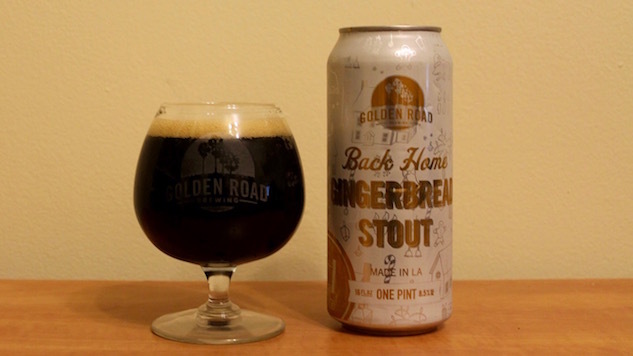 Gingerbread Stout is a holiday beer from sunny Los Angeles, a beer that replicates desserts and even includes a cookie recipe to highlight that fact. At 8.5%, it’s a winter warmer that goes heavy on the malt and even heavier on the spice. Pouring deep black with a brown head, Gingerbread Stout gives off an aroma that matches the flavor profile; Baking spices like cinnamon, ginger, and allspice rule atop a sweet and roasted malt base. Within the beer itself, the ginger snap undercuts the malt sweetness and makes it feel a little drier, but the cinnamon gets the tongue salivating and reignites a vanilla sweetness. Ultimately this comes across as a novelty seasonal beer, more cookie in flavor than beer. It’s similar to eating a ginger snap, but with a back of the mouth alcohol thickness that reminds you it’s a beer and not just a dessert. The spice bouquet overpowers the malt build and, consequently, the subtlety of the beer itself. When the stout flavor comes through, it’s mild and nutty with a chocolate note that gets washed over in the dominant ginger. There’s a bit of sediment at the bottom of the can. Gingerbread Stout is sold in four-pack tall cans, though it’s probably better shared in smaller pours among a group than taken as a happy hour pint. Like most spice-heavy beers, it’s likely divisive among Golden Road’s followers. At the start and end of the conversation, Gingerbread Stout is too much like drinking a cookie, instead of drinking a beer with cookie notes.